Midgate East Stables is run jointly by Laura and Gareth Adams. Laura has ridden since a child and as her parents couldn't afford to buy her a horse spent her teenage years helping at the local stables in exchange for rides and the opportunity to compete their ponies. In 1997 at the age of 14 Laura was fortunate to be offered the ride on Rosie by her owner and spent several happy years competing in a range of disciplines before buying her with the wages from her first job in 2001. 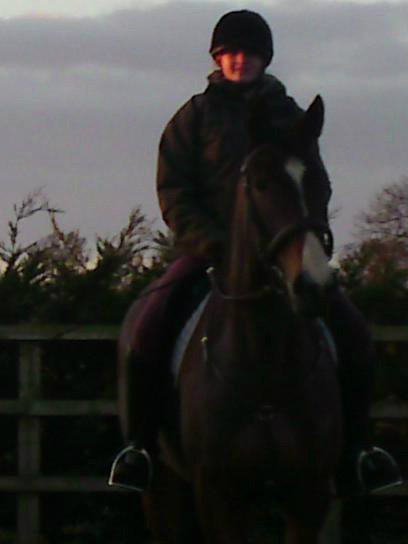 From the age of 16 Laura worked as an instructor and freelance groom whilst continuing her education. She holds the BHSAI and the Intermediate Stable Manager qualifications and also has a BSc (Hons) in Equine Sports Science. Laura worked as an Assistant Yard Manager at Moulton College from 2005 to 2007 and this provided valuable experience in running a large commercial yard. Since then Laura has been working in retail as with a mortgage to pay she needed a "proper job". She continued to compete on her beloved Rosie and after their marriage in 2009 Gareth suggested that she get a youngster to bring on for eventing as Rosie was starting to need a slightly easier life. Millie arrived as an unbroken 4 year old in July 2009 and very quickly became part of the family. Laura has brought her on herself to compete at BE90 level, they are hoping to move up to BE100 this season. After many years at livery Laura is enjoying having the horses at home and hopes to apply her experiences as a livery to run a horse and owner friendly yard. Gareth has been very involved with Laura's own horses and will assist Laura with the care of the liveries as well as carrying out maintenance tasks around the yard. He runs Midgate East Farms from the site growing wheat, barley and potatoes as well as supplying the yard with excellent hay and straw. Laura and Gareth together will run a friendly yard where the horses needs come first and all horses will be looked after with the same care as they would their own. Living on site ensures 24 hour supervision for the yard and a late check of all horses at 10pm is provided as part of the service.